Monday, June 23, 1913: Nothing much doing. Since Grandma didn’t write much a hundred years ago today I’m going to go back to a post I did almost two years ago on August 13, 1911. That post was about the difficulty of interpreting old cake recipes using modern techniques, ingredients, and stoves. 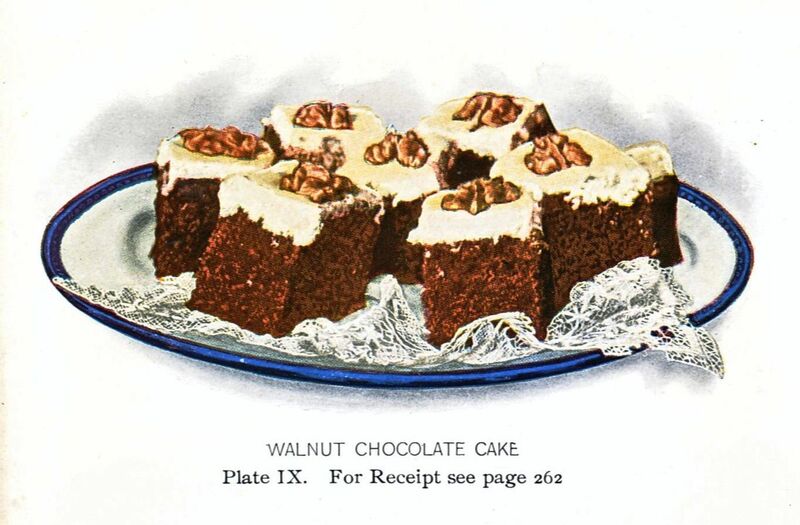 The post included a lovely picture of Walnut Chocolate Cake from Lowney’s Cookbook (1907)—but I didn’t actually make the cake. Somehow every time I flipped through the Lowney’s Cookbook that picture kept pulling me back. It felt like I’d wimped out—and that I still had some unfinished business with that recipe. Preheat oven to 350 degrees. Grease and flour two 8 X 8 inch cake pans. If desired, line with waxed paper to make it easier to get the cakes out of the pans. 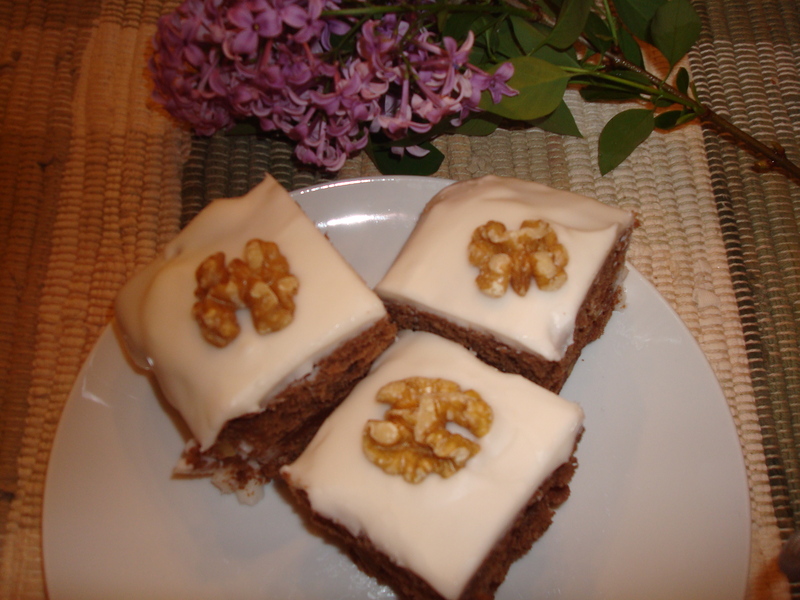 Combine all ingredients except walnuts and icings, and beat with electric mixer until smooth. Stir in 1/2 cup chopped walnuts (reserve remaining walnuts). Evenly divide the batter between the two pans. Bake until done (approximately 30 minutes). Remove cakes from pans while still warm (approximately 15 minutes after removing from oven). After the cakes are cooled put one cake on a plate and thinly spread with chocolate frosting. Sprinkle the remaining ½ cup of chopped walnuts on top of the chocolate frosting. Top with the second cake layer. Ice with the vanilla frosting. Decorate with whole walnuts. The bottom line: The cake was heavier than the typical modern cake—but delicious, and well worth the effort of trying to interpret the old recipe. Posted on June 23, 2013 August 23, 2015 by SherylPosted in Food, recipesTagged walnut. Next Next post: Did Grandma Want to Become a Teacher? Excellent. Looks delicious and I like the lilac placed on the table setting. Out of curiosity, did the original recipe contain baking powder? This was the time period when baking powder was a newly invented ingredient, and lots of different companies made baking powder. I don’t think that the composition of baking powder had yet been standardized so each company advertised theirs as using the purest ingredients, being the most dependable, and so on. Kudos! The finished cake all this time later looks absolutely scrumptious! I also like old recipes that use common ingredients and are relatively easy to make. Sometimes I think that back when people cooked more, that they tended to make really practical foods. yum yum yum… tasted as good as it looks, I expect 🙂 … Great job, Sheryl!!! yum! I’ll put on some coffee, you bring the cake! Walnut meats and already readi powder is kind of strange but yours looks yummy too so I think you interpreted correctly! I was particularly confused about how to make the chocolate filling that goes between the two layers. I ended up just using chocolate frosting with walnuts sprinkled on it–but my gut feeling is that the original filling was somewhat different. I have the 1912 version of Lowney’s cookbook. I know what you mean about converting it to a modern day recipe. It’s fun to read it, though. I’m sometimes amazed how much recipes have changed across the years. Some of the differences are die to changes in stoves. kitchen equipment, and ingredients. But much of the difference is in the level of detail. The old cookbooks seem to assume that readers had a really high level of basic knowledge, so they skipped most of the details. True. They didn’t have the pleasure of “convenience foods” like we do, they had to make everything from scratch, and probably grew up with the knowledge. Similar to a cake my mom used to make – but she used applesauce! I bet that it was good with applesauce. I make a cake that I call an applesauce cake, but it is a spice cake. You should give one of the recipes a try sometime. I have a lot of fun with old recipes, and I tend to think of old family recipes as living documents with each generation of cooks adapting it to suit changing technology, ingredients, and fads. I have some old cookbooks, but have not been brave enough to converting one and trying it out. Yay for you! The cake looks delicious, definitely something my husband would enjoy! I actually made this cake for my husband’s birthday, and really liked it. Does this ever bring back memories! My grandma Clarice Burr, born 1901 mad a cake that looked exactly like your photos. Every year, she and Grandpa would come back from Roseburg, Oregon with a burlap sack full of fresh walnuts from Uncle Ted and Aunt Ida’s orchard. We kids would get to help crack the nuts for cake like this, prune cake and Grandma’s famous caramels she sent to everyone at Christmas. I feel a blog coming on! Glad this post inspired you. 🙂 I also remember cracking walnuts (and hickory nuts) when I was a kid. The desserts that my mother made using them always seemed extra-special because of all the work that we put into getting the nuts. Lovely and the lilacs are beautiful, too! I think I have that old cookbook somewhere. I think that the Lowney’s Cookbook was a really popular one back then. It was published by a company that made various types of baking chocolate. I assume that it was relatively inexpensive since it was sort of an ad for the chocolate–or maybe they even gave it away.